The Walt Disney World Resort has a growing multitude of character meet and greets within all of the parks. The majority of characters do sign autographs, which make for amazing souvenirs. Plus, who does not want to have the signature of their favorite Disney character? You might as well do it in an official Disney World autograph book. Some guests will by an encyclopedia of characters, and have each one they meet sign his or her name on the designated page. Keep track of every event in the theme park you are visiting. Times guides cover every time from characters, to shows and park hours. There are far too many spectacles and stellar opportunities at Disney to forget bringing your camera. For those who choose to go beyond the standard photography on their phones, there are plenty of top-notch shots to take. Parades like the Festival of Fantasy and fireworks like Illuminations: Reflections of Earth, are moments meant to be captured on a professional camera. In order to out-snap Disney’s Photopass, don’t forget to pack your gear! If you are constantly snapping and uploading pictures, texting and making phone calls, your phone will not survive an entire day at Disney. Be sure to pack your charger because nothing is more frustrating than getting separated from your family and being unable to contact them. While Disney parks do offer charging for your phones, you must leave them at the front of the park and return later. Save yourself the trouble and keep a charger with you at all times. The Magic Kingdom even has a section under Rapunzel’s tower that is devoted to charging stations. Your credit card, debit card, and magic band meal plans can all fail you at times. Whether technology fails you or one of your cards is lost, you should always carry cash on you. This is also important because several venders at Disney World only accept cash. Some spare dollars and change can get you that water bottle or spray fan in the most desperate situation. Disney parks in Florida have hit triple-digit heat before. Make sure everyone, especially your more sensitive little ones, is coated in sunscreen. With all of the waiting you will be doing in lines for rides and on the streets for parades, you are in perfect position for a barrage of the sun’s rays. Much like number five, these are crucial to surviving the Florida sun. The sun always finds away to blast its rays against your face from wherever you are in the park. If you find yourself on the sunny side of the Jungle Cruise or are zooming down the blazing Tomorrowland Speedway, sunglasses are a must. When the sun is not blaring down on Disney parks, the rain can be torrential. Many guests know that the sunniest days are sometimes a gift, and that Florida showers can last anywhere from ten minutes to an entire day. Whether they’re just snacks or a full lunch, bringing your own food can save plenty of money at Disney. The smallest meal portions can be over-priced at Walt Disney World, so any food you bring can only help your wallet. Hydration is the greatest necessity for your Walt Disney World adventure. Regardless of the weather conditions around it, the parks push your body to extraneous stress levels. Don’t push yourself beyond these strains. Staying hydrated will allow you to participate in more activities while keeping your body in check. Instead of packing bottles of water, you should invest in a Camelbak. This hands-free hydration system can keep you healthy on the go. By succeeding at preparing, you have prepared to succeed. 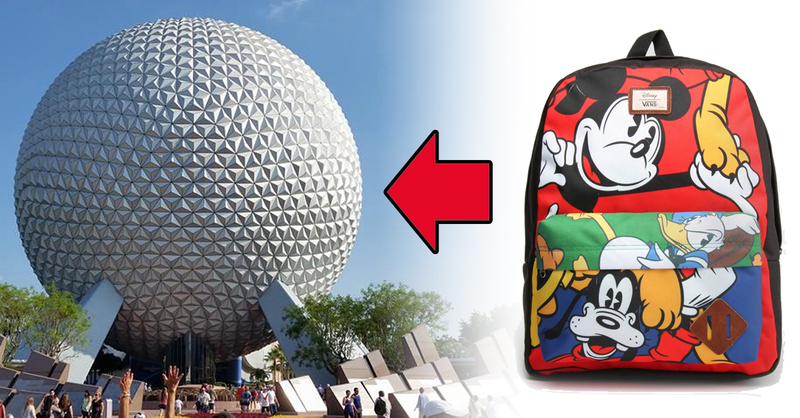 Keep your bag packed with essentials and you will have the time of your life at Walt Disney World!